This week at the Cutting Cafe, we were to use the relatively new file, 3D Cup Template and Cutting File. This is a cute file that you can keep full size as a treat holder or RAK holder, or you can do something a bit different and resize the file and make tiny favors with it. Although the file comes with a lot of sentiments, I made my own which just says Mugs & Kisses and I filled it with Hershey’s Kisses. Be sure to stop by The Cutting Cafe Blog on the 7th and 21st of each month. That is where you will find the design team posting! Leave a comment and you will be eligible to win three files or your choice. This week at The Cutting Cafe, it was all about jars. There are many files to choose from but I chose the Jar Shaped Cards file and used the mason jar with window. I sized it down quite a bit to make them mini. Masculine Valentine Treat Mailbox – The Cutting Cafe Design Team Project. Hello everyone! This week at The Cutting Cafe, the design team is all about Valentine’s Day. Since we all have men in our lives, I decided to make my project with the men in mind. I used the Mailbox Template and Cutting File Set. There are two mailbox versions. I used the second one and used non-traditional colors to give it a more masculine feel, as well as some brads that look like screw heads. I used the patterned paper on the sides also. Stop by The Cutting Cafe Blog on the 7th and 21st of each month to see the design team posts. There is always lots of inspiration. Leave a comment and you just might win three files of your choice on the next posting date! Hey all! Christmas is just about a month and a half away! Where did 2016 go? It was just summer!!! Well it is time to get started making those little gifts for family, friends, co-workers, etc.! The Cutting Cafe has the perfect new file to help you out with treat giving. The Gable Box file come with a lot of variety so that you can customize your box for the occasion. There are windows that come in different shapes, some have words in the window. You can choose straight edge or scalloped edge. There are toppers you can add. I made the plain box in white and used a black/gold/white paper for the topper pieces, then added a sentiment from the paper stack, and finally added a HUGE gold poinsettia clip that is just over the top! The recipient can take the clip off and use it for decor or add to a package of their own. Here is the box without the Poinsettia. Hello there! It has been a month since I posted anything! I am sorry for the wait! But today I have two cute milk cartons I made for The Cutting Cafe‘s Design Team! These will house goodies for my god children. I used the Halloween and Fall Milk Carton cutting file. The file comes with several cut outs. I used the leaf and the pumpkin and added acetate to the window cutout. Here is the back. See the bling on the border at the bottom! Be sure to stop by the Cutting Cafe Blog and see all of the design team inspiration which we post on the 7th and 21st of each month. Leave a comment and you will be entered into a drawing to win three free files of your choice. The winner is randomly pulled on the next design team posting date. Plus we love to read your comments! This shows the window in the box without the white card that I used to help show the words better. The actual box is made with the Chinese Take Out Box cutting template. This can hold candy or a little gift. And it is quick and easy to do! I just added flowers on the sides but you can attach a handle using brads as the file even cuts the holes for you to use. I added a flower to the side but you can attach a handle to each side if you choose. Hey Everybody! The 4th of July is coming soon and we got to design in red, white, and blue for out design team project for The Cutting Cafe! I chose to use the Star Box. It came out so cute! You can give little treats as gifts for adults or kids. 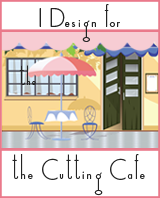 Be sure to stop by The Cutting Cafe Blog on the 21st and 7th of each month for our design team postings. You will find lots of crafting inspiration and if you leave a comment, you will be entered into a drawing to win three files of your choice!